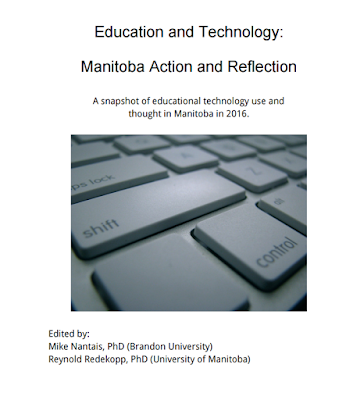 Late last year my colleague, Dr. Rennie Redekopp (University of Manitoba) and released a new free eBook we edited title Education and Technology: Manitoba Action and Reflection. This book consists of 15 chapters written by Manitoba Educators. The book is divided into 4 parts: Current Trends and Issues, Connecting and Sharing , Stories of Personal Transformation, and Where Do We Go From Here? The book was an idea I had over a year ago and Rennie agreed to help out. The chapters paint an exciting portrait of educational technology use in Manitoba schools. The editors hope that it can act to inspire others to implement educational technology in thoughtful and meaningful ways.